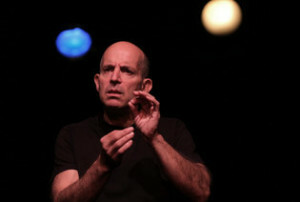 The low-key Mr. Zimmerman, who waited tables in New York for almost three decades while planning to become a famous actor, proves in this solo show that we have yet to hear every variation on a would-be actor’s struggles or a Jewish mother’s disappointment. His topics are a mix of the familiar and the mordant, with jokes about plane travel, supermodels on talk shows, his uneventful love life, a reality-show concept that involves a Kardashian and a sniper, and how gentile mothers react when their sons have to break dinner dates with them (“O.K.”). Not all of the material is exactly exclusive. When he recalls a diner asking him the difference between the Bordeaux and the Côtes du Rhône, you know he’s going to answer, “About a dollar.” But much of this amiable 90-minute set is distinctly original and bittersweetly on target. 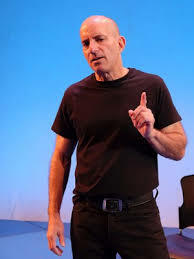 After Mr. Zimmerman adjusted his career focus, taking a class in stand-up comedy when he was in his 40s, he became the opening act for major stars including George Carlin and Joan Rivers. About an hour into the show, there’s a powerfully poignant riff about Mr. Zimmerman’s long-dead father that could make Billy Crystal cry. Near the end, Mr. Zimmerman verges on sharing more than everybody may want to know about his psyche. The demons or angels that drove Mr. Zimmerman to keep plugging away all those years are interesting, but we don’t need to know his process; we just enjoy reaping the benefits. 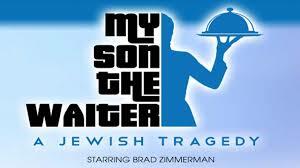 “My Son the Waiter: A Jewish Tragedy” is at Stage 72, 158 West 72nd Street, Manhattan; 212-868-4444, mysonthewaiter.com.